Can I Sack Someone Who's Been Employed Less Than Two Years? Can I Sack Someone If They’ve Been Employed For Under Two Years? You may be aware that if you sack an employee, they only have the right to claim unfair dismissal if they’ve been employed for more than 2 years. This minimum length of service is known as the qualifying period. This means that it’s relatively safe to sack someone who has not yet been employed for the qualifying period, even if you don’t have a fair reason for dismissing them. The purpose of this minimum length of service is to ensure employers have sufficient time to assess the suitability of an employee. However, there are some pitfalls to avoid. 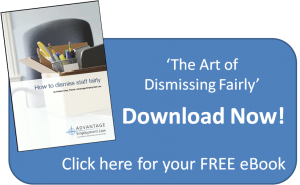 A full list of dismissals that are deemed automatically unfair can be found in the Employment Act 1996. As an employer, the law does not allow you to discriminate against an employee on the grounds of any protected characteristic, such as race, gender, or religion. A full list of protected characteristics can be found here. To state the obvious, if you were to dismiss someone because of their skin colour, the employee would be able to claim compensation for discrimination, even if they’ve only recently started their job. Indeed, they could claim compensation even if they haven’t started work yet. There are however some less obvious ways that you could unintentionally discriminate against a member of staff. For example, you may decide to sack someone because of their sickness record. If they have been employed for less than 2 years, they can’t claim unfair dismissal. Previous Entry: Can a Bailiff Still Take my Goods if I have Applied for the Default Judgment to be Set Aside?